The CT505-30 supports SIP VOIP calls, including RTP data-stream generation. It can make 30 calls to itself (60 VoIP soft phones) per chassis. The CT505-30 is excellent for testing whether or not an existing infrastructure can handle increased VoIP call load, and can also be used to test SIP gateways and other infrastructure. The CT505-30 uses the MAC-VLAN feature to allow one virtual interface per phone, so each phone can use a unique IP address and use standard SIP protocol ports. 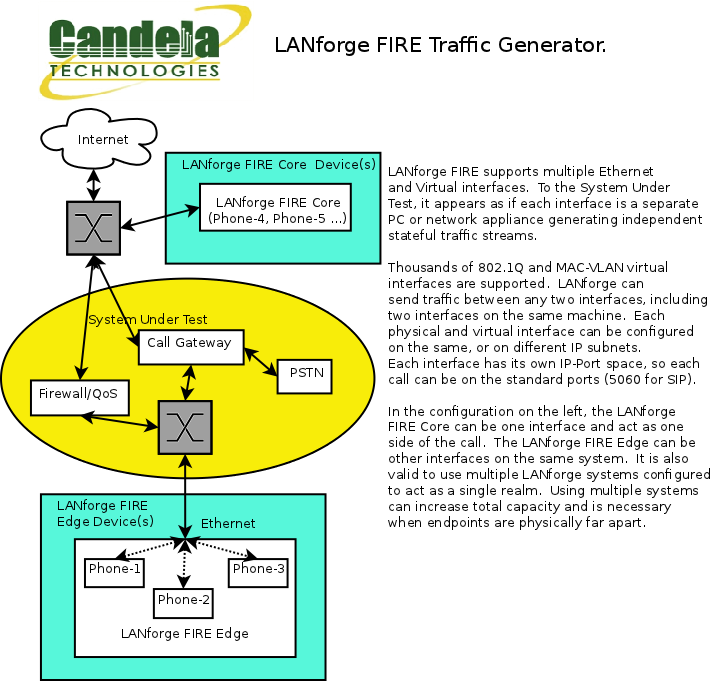 Normal LANforge-FIRE traffic generation features (Ethernet, UDP, TCP, HTTP, etc) is also supported by the CT505-30 at no additional charge. The PESQ automated quality scoring module is included. The CT505-30 1U rackmount chassis fits into a standard rack and is only 14 inches deep. It supports standard VGA, Keyboard, and Mouse interfaces for easy console/desktop access to the system. The rackmount chassis is relatively noisy, so it is better for a data center deployment than a desktop environment. Other form factors better suited for traveling or desktop use are also available at similar prices and performance. More powerful systems are also available and multiple LANforge systems can be clustered together into a single managed realm for increased call capacity. No additional hardware or software is required, but you may wish to manage the system using the LANforge-GUI on a separate machine. Connect one or more traffic generating ports to the downstream side of the device under test. This usually is considered the 'client' side of the network. Connect one or more traffic generating ports to the upstream side of the device under test. The CT505-30 should now boot. If DHCP is enabled on the Management network, the CT505-30 will automatically acquire an IP address. If DHCP is not available, the IP address will be set to 192.168.1.101 by the LANforge scripts. Start the LANforge-GUI on the management PC, or the CT505-30 console if managing locally, and click the 'Discover' button. It should find the CT505-30 appliance and add the IP address to the drop-down box in the Connect widget. Press 'Connect' and you will be connected to the CT505-30. Select the Layer 3, Layer 4 and other LANforge-FIRE related tabs in the GUI to see existing traffic connections and to modify them or add new ones. You can also view a real-time report of the test with the 'Display' button for some traffic types. LANforge can send Layer 3 traffic types between any two physical ports, so one can send traffic between port eth0 and eth1, eth0 and eth2, eth3 and eth4, etc. Use the Port Mgr tab in the GUI to configure the IP addresses for the interfaces as appropriate for your network and cabling. Any modifications take place immediately after you click 'Submit'. The CT505-30 is able to support 30 calls and 1Gbps or more of regular network traffic, depending on protocol mix and speed of the network under test. The portable chassis configurations may run at different speeds than the 1U rackmount systems.